Have you ever wondered why most delivery guys opt for road bikes? This is because they can convey you to your destination a lot quicker, not to mention the numerous health benefits you enjoy on its jolly ride. This Vilano Shadow Road Bike review will inform you of everything you need to know about this product so you can go ahead and make the purchase. Before you set out to purchase a road bike, there are a few considerations you will need to take note of. The good news is that unlike other bike types, the road bike is suitable for almost everyone from teens to seniors. However, before you pay for a mountain bike, you should vividly answer the following questions; what is the purpose of your getting the bike? What is the size of your budget? What is your appropriate bike size? What frame material should you go for? First of all, let’s look at the purpose of purchasing a road bike. Road bikes can serve various purposes including commuting, racing, and recreation or even tour. On this note, it is important to figure out what you would be using it for. While they are great bikes that can perform all these functions, some bikes are designed to function for specific purposes. Next thing you should consider is the size of your budget. As a general rule, the more money you spend, the lighter and more specified your bike would be. 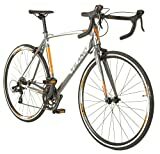 Road bikes generally cost from a few hundred dollars to thousands for premium ones. So it is important to decide how much you are willing to spend to get your ideal road bike. Having decided on your budget, you should also consider the type of frame material in your favorite road bike. This largely depends on your budget or how much you’re willing to spend. Common frame materials in use include Aluminum, steel, titanium and carbon fiber. Aluminum is the most common frame material because it is lightweight and durable when compared to other metals. It is also relatively affordable. The durability and lifespan of your road bike will greatly depend on the frame material in use; therefore you shouldn’t shrink your budget for a low quality or flimsy frame material. Finally, you should check for the appropriate bike size for you. Just like you would feel uncomfortable in undersized or over-sized shoes, you will also experience great discomfort with a wrong bike. There is no universal size of bike for everyone, hence you should check the frame size and ensure that it would be appropriate for you before you go ahead to make the purchase. The Vilano Road Bike is an excellent road bike that is capable of meeting all your road biking needs. It is sturdy enough to accommodate your body’s weight while you go on a jolly ride. Whether you require a road bike for recreation or just sporting, this product will meet your needs and esteemed satisfaction. It will make a really nice gift and is suitable for both genders irrespective of your city. This Vilano road bike is designed with a very durable 6061 aluminum frame. This feature ensures that the bike is very sturdy, lightweight and will stand the test of time. Unlike other road bikes with heavier or denser frames that are more difficult to ride, this bike features a lightweight aluminum frame that is very durable and you can easily hit the road at any time. This product also comes with an integrated headset. Aluminum frames are the most common bikes available today because of its great performance. It is the frame component of most mid-range bikes including this one, which makes it worth its price. This product features smooth, thin and sturdy wheelset that will ensure your ride is smooth and steady. The rims are 700c double-walled CNC machine sides with 700c x 25c tires. The tires are thin, designed for the road and are excellent for club rides, fitness routines, and first-time riders. With this amazing bike, you can achieve all your biking fitness goals with ease. This is because it has a durable design and it is well known for its performance. It is your ideal road bike for commuting and club rides too. It is also great for recreation and short or long distance errands. This is because it is equipped with Shimano front and rear derailleur and up to 14 speeds, perfect for all your road biking needs. The saddles of this bike are well padded for good comfort. The seat post is alloy 27.2 and the saddle is designed for anatomic comfort. Hence, you may not need to replace the saddle of this bike if your comfort is a priority. You can go on long rides and you wouldn’t have to worry about the stiffness of your saddle because this product takes care of that. Question: Is this a 21 or 14-speed bike? Question: Will the 58cm work for a 6ft? This is a great alternative for the main product with outstanding features that will cost you about an extra 100 dollars. Just like the Vilano, it is ideal for relaxed riding, club rides, and commuting. This product is equipped with 3 different gearing options so you can pick one that best suits your needs. It is also lightweight and designed with a durable frame. The frame of this Pure City bike has a lifetime warranty. In addition, this pure city classic is a great road bike and is ideal for women. This Vilano R2 commuter aluminum bike is another ideal alternative to the Vilano Shimano shadow road bike. Just like the main product, most Vilano bike parts are very durable and easy to assemble. This product, however, comes with 21 speeds unlike the 14 speeds in the main product. It is very affordable and also features a lightweight aluminum frame and Shimano shifters. It is ideal for commuting and all your road biking needs. Road biking or cycling is an exercise that has a lot of health, fitness and social benefits. Research has shown that biking every other day can decrease insomnia while strengthening and keeping you fit. Moreover, it is a very effective part of a fitness or weight loss routine and it is an absolutely fun way to begin your day. The Vilano shadow road bike is an ideal bike for your daily cycling needs because it is designed with features for satisfactory performance. From its durable and lightweight design to its comfortable saddle, tires and great gear system, all beautifully designed to enhance its performance. If you’re looking for a great road bike at a decent price, you should probably stick with the Vilano road bike review and you will get great value for your money. Click here to check out this amazing road bike.